Diet fads come and go, making it confusing to know just how many fat grams per day you should get. What you should not do is eliminate fat. Fat provides some vital benefits for your overall good health. Fat serves several important functions in your body, making it necessary that you consume the proper amount of fat grams per day. Your body contains about 18 to 25 percent fat. This fat provides a ready source of energy as well as a major energy storage site. Your body can produce most of the fat it needs except for two essential fatty acids, inoleic acid and linolenic acid. Both of these fatty acids help your heart function properly and support your immune systems. The American Heart Association recommends that dietary fat should make up no more than 30 percent of your diet. Unfortunately, the average American diet includes 34 percent fat. How many fat grams per day should you have? The amount you need to consume is based on your weight, your activity level, and your total calorie intake. A moderately active, 150 pound woman should limit her fat calories to 540 calories per day, which equals 60 grams of fat. Fat contains 9 calories per gram. This calculation assumes 12 calories per pound, with fat making up 30 percent of the diet. Of these 60 grams of fat, limit saturated fats to 10 percent or 6 grams. 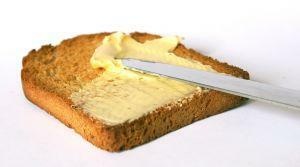 Saturated fats include butter and lard, which are solid at room temperature. You can imagine how they may appear in your body. Both polyunsaturated and mono-unsaturated fat occur as liquids at room temperature. Cooking oils are common examples. You should aim for an even balance of these types of fat from your remaining allotted fat grams, or about 27 grams each. Controlling the amount and type of fat in your diet begins with following one of the available low fat diets. Focus on getting the fat you need, in the proper amounts.